Maybe this is another Cloud migration issue. The last few days, when I get something in "Your notifications" such as a new "like" received and click the link, it takes me to my profile page but never shows the "like" or post quote or whatever. Chris, click on the number, underneath the likes recieved, it is in blue or red. They will appear and you can read the new ones, then the notification will be gone. It does have to do with the cloud I was told. MomsSol, rob the elder and CycleCat like this. We're seeing this on a few sites. As skerfan said, clicking the number under the likes received in the mini stats will bring you to your likes. "Mini stats?" If you mean the drop down window, it doesn't matter what I click. I used to be able to click "New likes received" or the number and see a list of all my current, old likes & quotes. Now I just see my see my profile page. I'm still using Windows XP. Here is what I see when I click "Your notifications." I see both of these posts having that image as an attached thumbnail. What happens when you attach the image? Do you not see it in the posts? As for the likes issue, when you go to your profile page (the one it takes you to when you click likes received) on the right hand side there is a small box called Mini Statistics. Your likes received will be there which you can click on to look at / clear your likes notifications until we get it resolved. 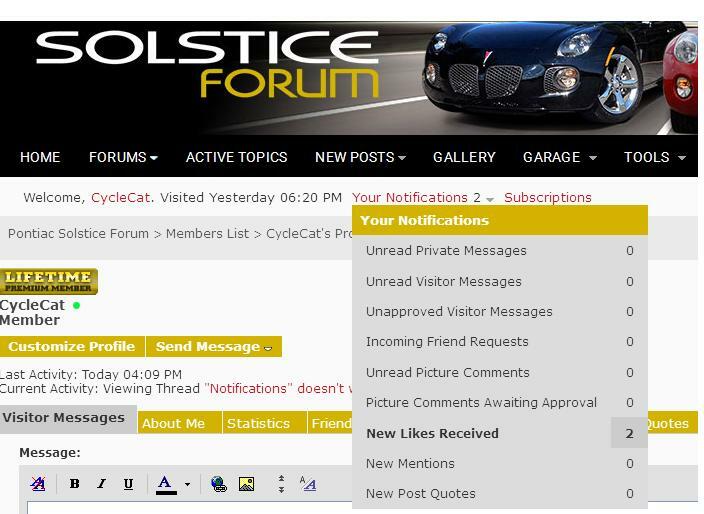 FWIW, I have issues on the Skyroadster forum too. Sorry about the image thing. It was lag in it appearing with my first attached photo. By the time I tried the alternate message, the thumbnail had appeared. NOW I understand what you all are saying about mini stats and the number to click. Thanks!